Another day, another report saying Android rules the smartphone world, this time from Gartner. Gartner's first-quarter numbers say Android leads in worldwide smartphone market share, accounting for 36 percent of sales. Nokia slipped to second place with 27.4 percent market share, followed by Apple's iOS in third place with 16.8 percent. Research in Motion's BlackBerry and Microsoft's Windows phones round out the top five with 12.9 percent and 3.6 percent, respectively. Often lost in the market share horse race coverage is the fact that nearly all smartphone platforms are growing, and fast. Symbian lost market share year-over-year, but sales grew by nearly 15 percent. iOS only gained 1.5 percent market share year-over-year, but unit sales more than doubled. On the whole, Gartner says smartphone sales grew 85 percent compared with the first quarter of 2010, now accounting 23.6 percent of overall phone sales. The only losing mobile platform? Windows phones, whose unit sales fell by about 1 percent as Microsoft tries to transition from its old Windows Mobile to the new Windows Phone 7. Gartner doesn't list WebOS individually. 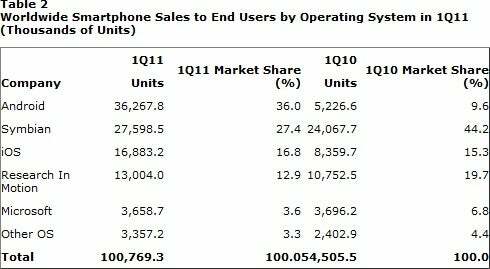 While Android seems to be making huge gains, the real smartphone explosion is coming from what Gartner calls "other" manufacturers, whose collective unit sales grew by 48.5 million year-over-year. No other smartphone maker has seen growth like that. In fact, several vendors that have embraced Android have seen their total year-over-year sales fall, including LG, Motorola and Sony Ericsson, as their businesses transition to smartphones. We can assume that a large portion of worldwide Android growth comes from the "other" category, consisting of brands you've never heard of in emerging markets. That said, there are plenty of studies and surveys showing Android's ascent in the United States, where big brands reign.